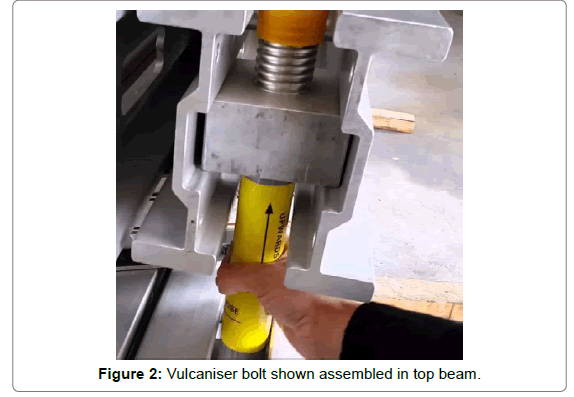 This article provides a summary of the findings from examining a failed industrial bolt used in a vulcaniser for splicing conveyor belt. In summary, the fracture plane is nearly completely catastrophic. There is a small area which does appear to be fatigue failure. The surface is perpendicular to the thread edge and located at the stress concentration at the thread which is typical of fatigue crack initiation. The fatigue failure area is quite small compared to the rest of the failure surface which indicates that the part is susceptible to catastrophic failure after relatively little fatigue which therefore suggests that the inspection for fatigue must be done quite often and in quite a detailed fashion to detect the crack. Conveyor belt arrives at site on large reels which must then be spliced together. Splicing is done with the use of a vulcaniser which applied appropriate temperature and pressure to join the ends of the rubber conveyor belt. The vulcaniser beams are held together against this pressure by vulcaniser bolts (Figure 1) . 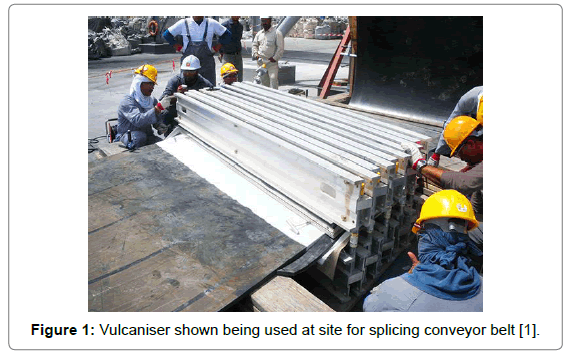 Figure 1: Vulcaniser shown being used at site for splicing conveyor belt . The vulcaniser bolts connect the top and bottom vulcaniser beams during splice curing (Figure 2). Figure 2: Vulcaniser bolt shown assembled in top beam. The bolt under consideration failed during use. It has been assumed that the bolt was used as per manufacturer guidelines. As can be seen in Figure 3, the bolt broke near to the end of threads in the nut. 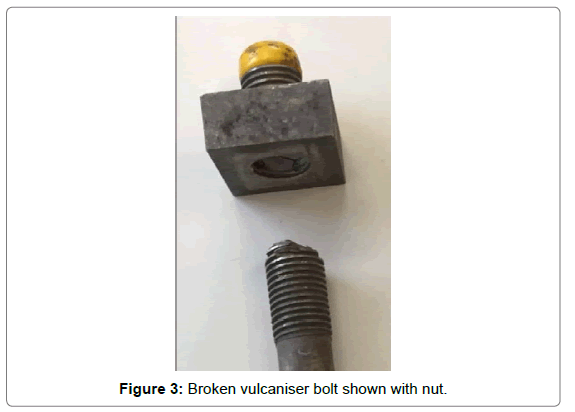 Figure 3: Broken vulcaniser bolt shown with nut. 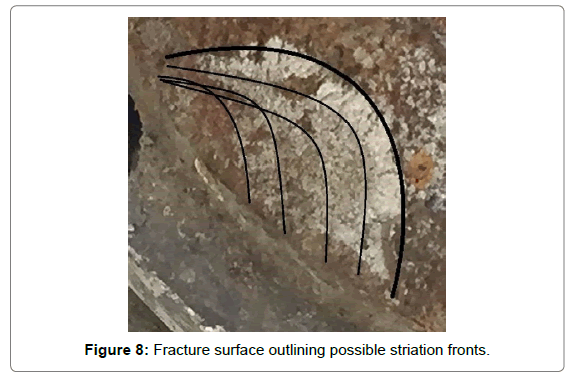 The side of the fracture surface shows the surface to be quite undulating as opposed to a flat surface which is associated with fatigue failure. The predominant mode of failure for the bolt was therefore catastrophic failure (Figure 4). Figure 4: Side-view of fracture surface (low magnification). A low magnification image of the fracture surface is shown in Figure 5. A higher magnification view was taken at the area outlined by the black box. Figure 5: Fracture surface (low magnification). A higher magnification (of the black box area shown above) shows a smaller area that is flat i.e. perpendicular to the tensile loading that the bolt was experiencing during use. The flat area is a typical thumbnail shape that is often associated with fatigue crack growth. The crack front is shown outlined with a black line for ease of visualisation. The crack would have initiated along the inner diameter edge of the bolt thread (Figure 6). 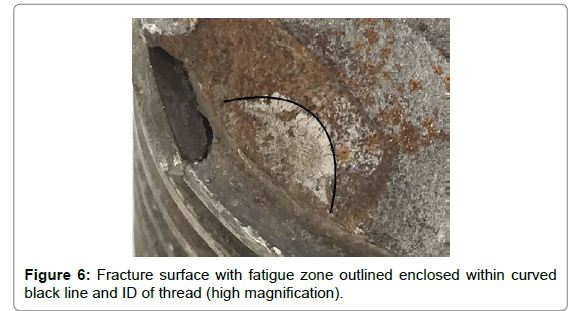 Figure 6: Fracture surface with fatigue zone outlined enclosed within curved black line and ID of thread (high magnification). Figure 7 shows a higher magnification view of the side of the bolt. The ID thread edge of the thumbnail crack is shown below also with a black line for ease of visualisation. As can be seen, the flat thumbnail crack is nearly parallel to the ID of the bolt thread. The black lines shown in Figure 7 measures approximately 8 mm in length. Figure 7: Side-view of fracture surface (high magnification) showing flat fatigue surface (black line) parallel to ID of thread trough. Based on the author’s experience and knowledge, a number of possible striation fronts are identifiable and outlined in Figure 8. As can be seen, fatigue crack growth approaching catastrophic failure indicates that fatigue crack growth was relatively rapid over the last 5 uses of the bolt. It is likely that the fatigue crack initiated at least an equal number of uses prior to this more rapid crack growth as catastrophic failure approached. 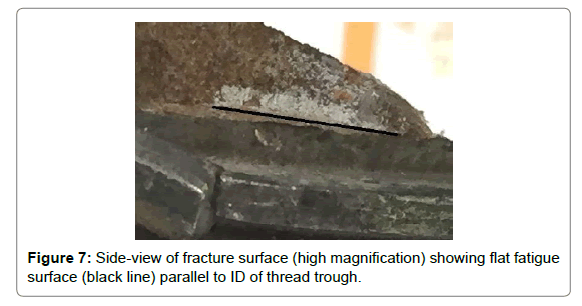 Based on these observations, it is anticipated that the fatigue crack would have been present for at least 10‐15 uses prior to catastrophic failure. However, detection of the fatigue crack would be limited by the NDT technician and the instrument or method of NDT. Figure 8: Fracture surface outlining possible striation fronts. In summary, the fracture plane is nearly completely catastrophic. There is a small area which does appear to be fatigue failure which is outlined in the figures. The surface is perpendicular to the bolt length and located at the stress concentration at the thread which is typical of fatigue crack initiation. 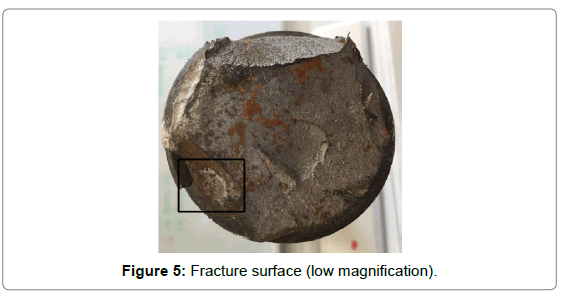 The fatigue failure area is quite small compared to the rest of the failure surface which indicates that the part is susceptible to catastrophic failure after relatively little fatigue crack growth which therefore suggests that the inspection for fatigue cracks must be done quite often and in quite a detailed fashion to detect the crack. Copyright: © 2019 Wheatley G. This is an open-access article distributed under the terms of the Creative Commons Attribution License, which permits unrestricted use, distribution, and reproduction in any medium, provided the original author and source are credited.